The Knights Templar were the military arm of a powerful religious order in the 12th and 13th centuries. 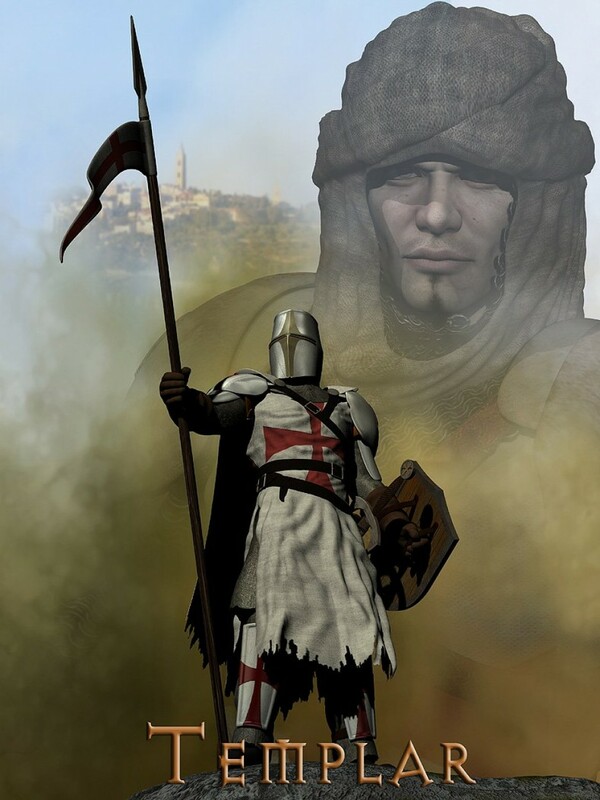 Templar Knights, in their distinctive white mantles were among the most skilled fighting units of the period, while their wider organization oversaw a massive economic infrastructure across Europe. In 1307 the Order fell into disrepute and was disbanded abruptly in 1312, giving rise to speculation and legends that persist into the modern day. Mortem Vetus are very proud to present this feature-packed extensive clothing set for Michael4, for you to create images of history and legend. Included are 17 conforming clothing items for Michael4 - Belt, Boots, Cloak, Coif, Gloves, Greaves. Helm, LegGuards, MailShirt, Pauldrons, Scabbard with Sword, Scabbard without Sword, Shemagh, ShoulderStrap, Sword Belt, Tabard and Trousers. There are 6 props included - Sword, Shield, Lance each with left and right versions. All items come with multiple MAT options - Belt(3), Boots(3), Cloak(14), Coif(3), Gloves(3), Greaves(4), Helm(2), LegGuards(3), MailShirt(5), Pauldrons(4), Scabbards(5), Shemagh(3), ShoulderStrap(3), Sword Belt(3), Tabard(58) and Trousers(3) for a total of 240 MAT poses. There are also 6 hand grasp poses to correspond to the props and 10 utility poses.